Ranked as the 16th largest and known as the Queen City or the City of Tree’s. 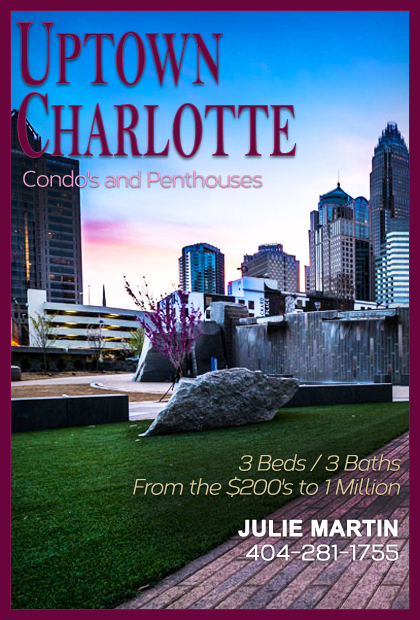 Charlotte is and up and coming vibrant city and one the fastest growing in the nation. If you live in Charlotte the city is referred to “Uptown” rather than what many cities might call Downtown. Home to the second largest Banking Center in the country the Uptown Corporate buildings are filled with every major Bank in the Country. Uptown is also host to two major Sport Team Franchises and Stadiums, the Charlotte Hornets and the Carolina Panthers. The recent addition of a fabulous Minor League Baseball Stadium has added to the significant growth of this welcoming Southern City. A light rail was added to bring commuters in from the South Side of the City that has expanded growth in the Southern corridor. This combined with huge influx of new Apartments along the rail line and a host of Condominium high rises that are under construction is fueling the growth of Charlotte. The addition of a Ritz Carleton Hotel Uptown brings an added since of prestige to this vibrant young city. As well as the growth within Theater and Arts Community make this a welcoming city for all ages. Newcomers from out of State will find Charlotte an extremely friendly city as its common for strangers to strike up conversation in public places in this classic friendly city that embodies the spirit of Southern Charm.